If ever there were such a thing as perfection I think I’ve just discovered it. And if you’re into cooking, it’s like creating the perfect dish. So what’s the dish? Well, it’s called the ultimate fly fishing holiday. And what are the ingredients that it makes it so special? Simple: take a crystal clear river, correct, season-long water temperature, an abundance of hatching insects and wild trout rising to the naturals from dawn until dusk. 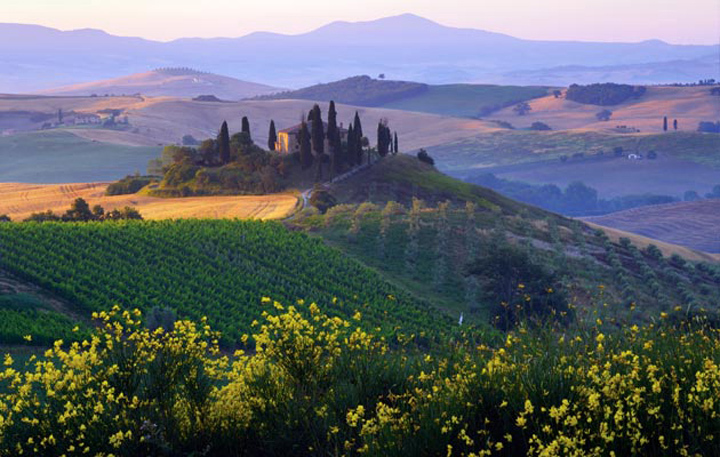 Then add glorious Italian scenery, medieval hilltop towns of breathtaking architectural beauty, and food to reduce an artist to tears of joy at its simplicity of creation and complexity of taste to the buds. Now call me a romantic if you will, but if these are not the combined ingredients of a fly angler’s perfect holiday, then you tell me what they might be. Sansepolcro is one of those wonderful medieval Tuscan hilltop towns. And although it may not be in the middle of the region’s most famous beauty spots believe me, its not half bad, and within half an hour’s drive of the more famous picture-postcard areas. But what it possesses that it’s more illustrious neighbours do not, are the tail waters of Tevere river (or Tiber to us English). And if you’ve ever seen the murk of the Tevere as it flows through Rome, you’d never believe it could exist in such pristine form less than a couple of hours drive north of the capitol. The Alto (upper) Tevere is nothing less than a fly fisher’s paradise and owes its very existence to the hard campaigning and great foresight of the “Mosca Club Altotevere” members. They, in successful partnership with the equally far-sighted local government have re-instated what had become a dry river bed (due to abstraction) not only to it’s former glory, but beyond all expectations, into a project that is fast becoming a benchmark for European Union river habitat reconstruction programmes. 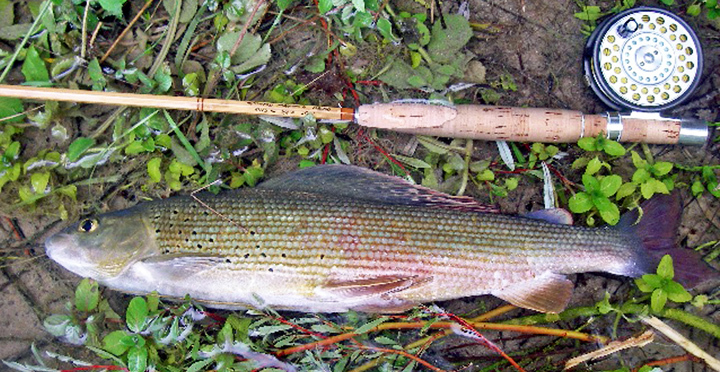 The club reintroduced approximately 30,000 grayling and 40,000 brown trout into the river six years ago. And if you’d seen the size they can reach, (grayling up to 3 lb and trout up to 6 lbs) you’d know just how successful they’ve been. Also the copious amounts of fingerlings of both species indicate the health of the now naturalized breeding fish. But for me it wasn’t the size or number of Trout that delighted most, it was their colouration: the deep gold’s of their full-to-bursting bellies and the brightest of vermillion spots adorning polished silver flanks; all would have done credit to Michelangelo’s palette had he created these piscatorial masterpieces himself. I was lucky enough to be introduced to the Tevere in the company of Luca Castellani, ace local guide and one of the founder members of the Club Altotevere. I guess it was one of those red-letter days that don’t happen too often in the life of ordinary fishermen like myself. But the memory of those eight hours or so I spent on the Tevere will certainly go down in my book as one such a day. And it was a much as anything to do with the rises – which literally happened in non stop profusion from the moment I set eyes on the water to the time I reluctantly dragged them away around eight in the evening. The amount of movement was astonishing: splashy rises, sub surface swirls, head and tailing, aerial acrobats in search of ascending flies, nymph chasing – you name it, all were on view.. That’s not say that catching was easy, far from it. These trout were immensely picky given there were multiple hatches all day long. So trying to pick a winning natural from the fly box was a bit of lottery. But what seemed to work best for me were cdc smuts that resembled nothing more than, well, nothing. Even Lucca’s box of natural tricks were having a pretty fallow day. Then to my astonishment Lucca produced his dish of the day - grotesque, foam Chernobyl ant in sizes from 18 to gigantic! It was the usual last chance reasoning – if they’ve seen them all, give them something that’s like nothing on (fishy) earth. I guess it’s a bit like living your life on a macrobiotic diet then gorging on Mega Big Mac Cheeseburgers with all the trimmings – oh, the heaven of gluttony. But catching was still tricky for me, mainly down to my usual over excitement and inability to ease into a take. Due to the crystal clarity of water I was fishing an 18 foot leader with 7x tippet – certainly longer and finer than I’m used to. Consequently I’d either rip the ant from their mouths before they’d had a chance to chew on it, or strike too hard and break the fine tippet. And also partly to do with badly constructed knots as 7x is too soft and fiddly for my clumsy fingers. It was a mean balancing act to get right and the dozen or so fish I caught in the course of the day became treasures for the memory bank. One of the extraordinary things about the Tevere is that the water temperature remains pretty constant the whole season long. The tail water of the Altotevere is fed from the bottom level of the Lake Montedoglio dam, some five or so miles upstream – this means the coolest water, irrespective of air temperature. 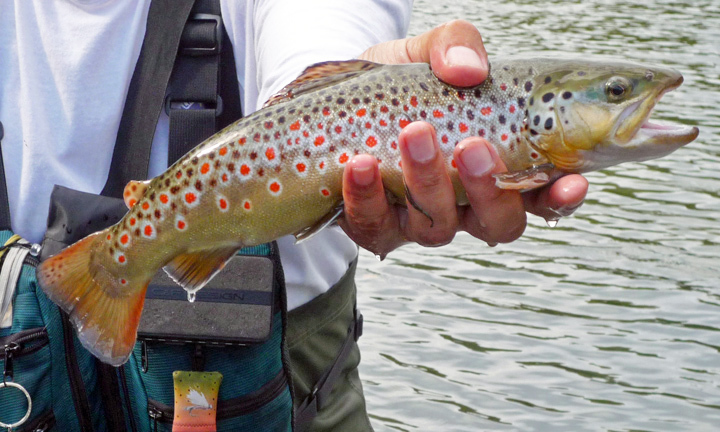 So cool in fact you wear long johns, or a least a couple of pairs of socks under your waders in the height of summer – which unbelievably is the best time fish. In the hottest months, the water temperature never goes above 50ºF - and it wasn’t until we left the water to go back to the Club house for lunch that I realized the air temperature was in the mid 80’sº F. The clubhouse is in an annex of a local hotel 5 minutes drive from the river. It’s a convenient place for an excellent lunch, with twenty rooms, a swimming pool, and part of its grounds home to a riding school. After lunch Luca took me to the stretch know as the ‘University’ as the trout there are older, larger and very well schooled in avoiding capture. This is where the Chernobyls came into their own. Although none of the really large trout came out to play, there was a good bag-full of around the two to two and a half pounds mark. Needless to say mainly caught by Luca on his giant Chernobyls, which probably weighed more than his eight and half foot three weight rod. The most memorable fish of the day for me, were the two I caught beneath University’s low bank-side overhangs and made difficult to cast to from distance. I’d made two or three passes, with the fish ascending gently to swirl inquisitively beneath the fly without taking. But when eventually they did, it was with an unhesitatingly hefty chomp! - and somehow I managed not to panic, and even the knots held firm as the beautifully coloured masterpieces sped away across the river with my fly firmly clamped in the jaws. As this was a family holiday I didn’t have much time for fishing but I did manage another half day on the Tevere on my own. And as luck would have it I bumped into Luca who was guiding an American client for the day. I’d already had a couple of nice fish on my cdc smuts before Lucca re-armed me with a little selection of Chernobyl’s. In truth, they didn’t work for me that morning. So I went back to the smuts, enjoying further success before calling it a day and driving the short distance to Sansepolcro to join my wife for a lunch of our favourite local dish; Tagliatelle, with wild boar ragu washed down with a local Chianti direct from the vineyard. – another Tuscan masterpiece. Luca and his partner, Mauro Raspini (President of the Mosca Altotevere club) can offer the visiting angler 7 km’s of the club’s Tevere water, and a further 12 kms of the upper and lower Nera river in adjoining Umbria (1.5 hrs from Sansepolcro) All waters are ‘no kill’ and strictly controlled by dedicated water guardians. 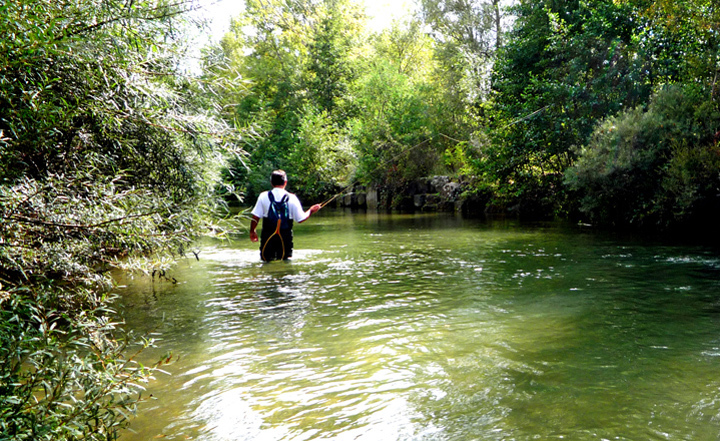 The Tevere season runs from May 1st to December 31st (prime time Mid July to end of September) And the Nera can be fished in late spring, along with several other local streams, whilst the Tevere waters are still coming up to temperature. The Nera season runs 1st April to 11th November. So next season I’m promising myself a ‘dedicated’ fisherman’s return to the land of Leonardo’s trout to sample all that’s available – including the wonderful local dishes and fine Chianti wines!